Wine, Cheese and Scrapbooking: Happy NSD!!!! Today's National Scrapbooking Day!!! Yeihhh!!! Believe it or not I think I'm not going to be able to do scrapbooking today... Precisely today!!! But I'm going to be doing great things anyway, so there's time for everything... (God's timing is perfect). But wanted to share a card I made making up techniques... You know how it is... Crazy Scrapper Myra... LOL! 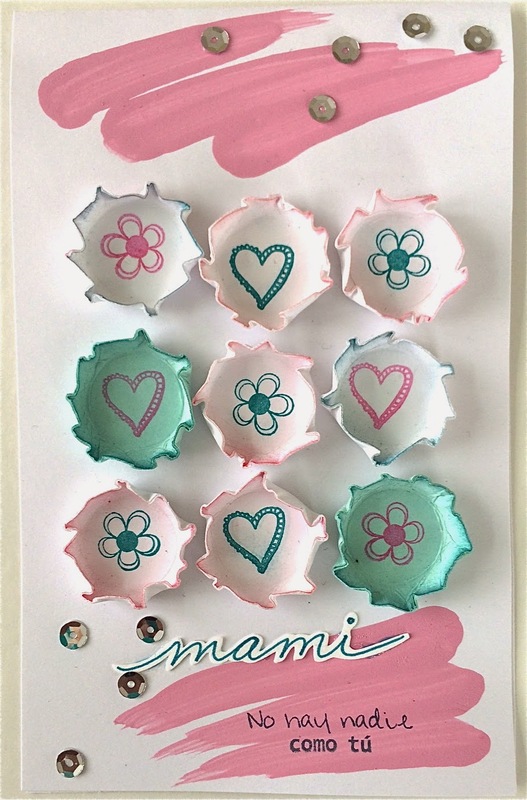 I used Latina Crafter stamps for this card and I love how it came together. First I painted with acrylic paint some free brushes at top and bottom of base of card. When dried, I stamped the sentiment at bottom. For the "bottle caps" I cut circles, stamped the images on them, inked the edges, and with a coin, I molded them to simulate the caps. Retrieved the coin and ended up with these. I love them. I finished up with some sequins. For the word "mami", I just hand-wrote it and cut. 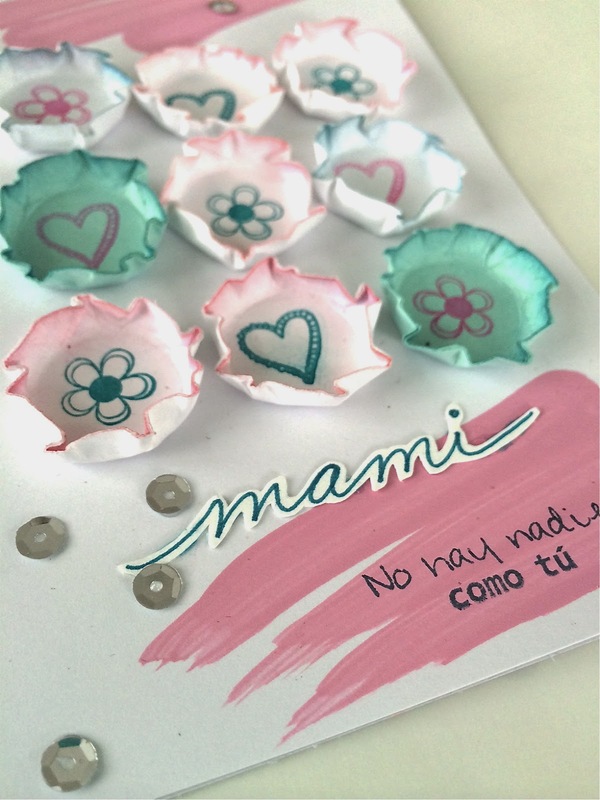 This card was published at the Papeles y Más magazine. Wanna know more about this magazine... Check it out HERE or click on my DT button at right. For Latina Crafter products also click HERE or use the button at right that says "Talento Latino". Have a great weekend... enjoy this day... and let's have a great month!!!! 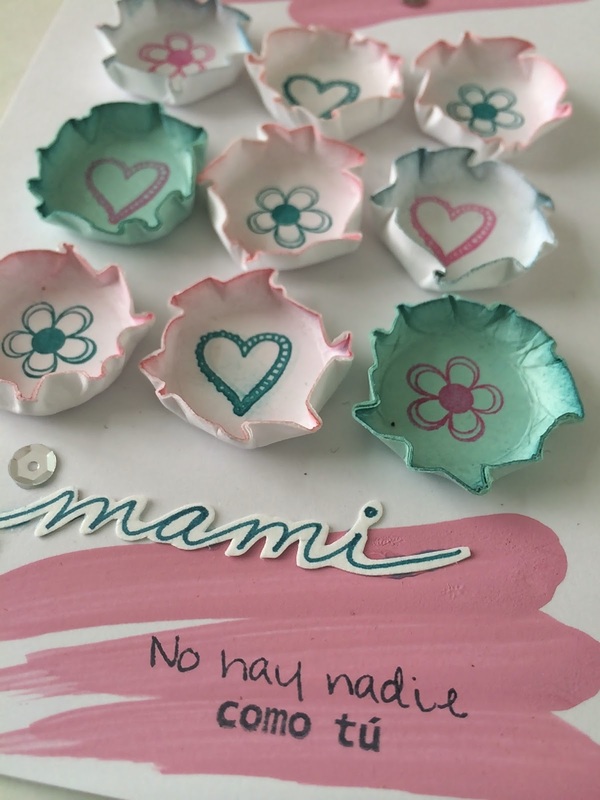 ¡Qué lindo proyecto simple, limpio, creativo y con poco materiales carayyy!